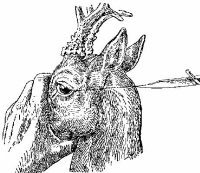 Whatever the type of game, before firing the hunter must be absolutely sure that he or she will be able to kill the animal as quickly as possible, without causing undue pain (weidgerecht), in case the shot does not result in immediate death. Any hunter who lacks the vital skill of putting a wounded, suffering animal out of its misery quickly and painlessly is guilty of cruelty to animals. Today, I would like to talk about human-animal relations in a hunting situation. More specifically, this paper is about the killing of animals. In hunting, the intention to kill is paramount and defining to the practice, although the outcome is far from certain and does not necessarily need to be fulfilled. As the philosopher Ortega y Gasset argued, „The beauty of hunting lies in the fact that it is always problematic“. In the following, I would like to spell out some of the problems of killing in the practice of today’s hunters in Germany. In doing so, I draw on the work of Garry Marvin who has already covered much of the ground regarding this topic. For Garry Marvin, killing in a hunting situation differs from other cultural (or domestic, as he calls it) practices of killing in that hunters cannot demand or command the death of the animal; hunters have to struggle to kill and do not simply ‚take‘ life; hunters enter the space of animals in order to kill; animals are uncontrolled and resistant to the hunters‘ intention; the killing is thus unpredictable. While Marvin (10) separates (at least analytically) killing from „other forms of deliberate infliction of injury or physical or mental suffering on animals“, I am interested here in a form of killing that involves both injury and suffering. It is a form of killing hunters call Abfangen in their specialist language. One could argue that it is a form of secondary killing, one that becomes necessary when the ‚proper‘ way of killing has not worked out and the animal was only wounded on the process. The proper way of killing (waidgerecht) is a clean and sudden death, ideally through one skilled shot only and therefore without any suffering. Killing in a waidgerecht way the hunters call erlegen (rather than töten/killing) – a term reserved for the proper killing of game and a term which reflects the special relationship that hunters claim to have with this group of animals. The Wild (game) deserves a particular kind of death out of feelings of responsibility that come with the hunters‘ practice of stewardship and care (Hege). All other animals (such as stray dogs or cats) are simply killed (getötet) and do not necessarily have the right to a waidgerechter death. That the term – as well as the practice of – Abfangen exists, however, shows that a waidgerechter death cannot be guaranteed and is uncertain. Hunters know that proper killing is not always possible and thus have a secondary practice which is supposed to correct any previous mistakes or mishaps. Yet Abfangen is not less problematic than the first attempt at killing. It should also be executed with skill, the death be clean and sudden, with the least suffering possible. What is different is that at that point the animal is already suffering and that makes the situation not only unsettling to the proper hunter (waidgerechter Jäger). It makes the situation highly problematic. Let me illustrate this with a brief story from my fieldwork. It was a fine winter’s day, in a forest in Germany. The air was cool and crisp, the ground covered with a thin coat of snow, the sky was blue and the sun shone so that everything sparkled around us. I was with a group of beaters, taking part in a pressure hunt on wild boar, roe deer and red deer and that had commenced about two hours earlier, in the late morning. I had just struggled to get out of a thicket of young trees, partially overgrown with the thorny trails of bramble and briar and now stood at the edge of a snow-covered meadow. I could hear the voices of the other beaters still in the thicket here and there, so I took a few deep breaths and looked around. Our dogs were nowhere to be seen. One of them had the tendency to disappear again and again so I tried to spot him. But all I could hear was one dog continually barking a bit further away, out of my sight. Was that him? I couldn’t really tell. Yet something wasn’t quite right. Usually the dogs moved around and so the barks should, too. But this barking didn’t move. As the other beaters were still inside the thicket I called out to D. that I would go and see what the barking was about. At the far end of the meadow there was a path separating a thicket to its right and left. The barking seemed to come from there. When I came closer I could see J, the dog I was looking for, about halfway down the path barking in front of the right-hand thicket, and a hunter was standing right behind him. I couldn’t make out what this was about but I speeded up now as I sensed that something had happened here or was about to happen. „What’s the matter?“ I asked the hunter, looking at him and at the dog still barking into the thicket. „A wounded sow’s lying there.“ He answered and pointed. Surrounded by thick layers of bramble, in a dip in the ground, I could now see her, lying there, watching us. And I suddenly realized the danger of the situation. I couldn’t see how strongly wounded she was, whether she was still able to attack us or not. I stood right behind the dog who tried to snap at her, and tried to call him away but without success. For the dog, only the sow was important now. Now the other beaters were finally arriving, too. D., an experienced forester and hunter, talked with the hunter next to the dog. The two women in our group came closer as well, but M. urged the inexperienced, young woman not to get too close as it was too dangerous. As I heard M.’s warning I realized that I was still standing right behind the dog, directly in the line of attack should the sow choose to burst out of her hiding. The dog was still barking all the time as suddenly the sow tensed and speeded forward, but stopped right in the movement and laid back again, eyeing us suspiciously, so it seemed. We all spread cautiously around her now, trying to be out of her way while still trying to hold her cornered. When D. removed his rifle from his shoulder I slowly began to understand what we were doing here. This was an Abfangsituation. There was a wounded animal and of course it had to be killed. Having never before been in such a situation, I just wasn’t aware that it would be right here, right now, and I right next to it. We moved in a bit, our dog checking in the sow from the front, D. and me from the side. With one hand only D. held the barrel of his rifle right to her head, behind her ear and pulled the trigger. Boom! The sow hardly moved. Was she dead? With a gnarl, the dog snapped at the sow’s snout, I tried to hold him back, thinking it somehow inappropriate to disturb her dying. The sow lay still but not different from before, although her eyes did not move. D. prodded her with the barrel of his rifle. Nothing. She was dead. We grasped her forelegs and dragged her out of the dip and the brambles. „Come on. Let’s move on.“ said D. to us, shouldering his gun and – with a goodbye to the hunter – we all moved on to continue the rest of our beat. In order to understand this Abfangsituation – in both its Abfang character as well as situational character – I suggest a phenomenological approach in line with Tim Ingold’s (2000) Heidegger inspired ‚dwelling perspective‘. From this perspective, I argue, a situation „emerges with its properties alongside the emergence of the perceiver as person against the background of involved activity. Since the person is a being-in-the-world, the coming-into-being of the person is part and parcel of the process of coming-into-being of the world as a whole“ (Ingold 2000:168). While being practically and bodily engaged the situation arises as something meaningful in relation to our activity. A situation thus is a gathering of Zuhandenes, things ‚ready-to-hand‘, i.e. things that matter because we have a concern. In other words, a situation is perceived – and can only be perceived – , because it (bodily) ‚affects‘ us, and i.e. because we have ‚learned‘ to be affected by things that matter. To identify – and thus to be able to act within – a situation means to know the ‚type‘ of situation by habitual practice and by having developed the appropriate skills that are necessary to cope with the particularities of each individual situation. Going back to my story of the killing of the wounded sow, the first point I want to make is that we need to look at the situation not as a determinate object of perception but to grasp the arbitrariness and indeterminacy of it, i.e. the coming-into-being of the situation. Long before we recognize the situation we are already absorbed, i.e. affected and guided by it. The situation begins to organize itself ‚against the background of involved activity‘ and thereby crystallizes. At the beginning of the story, I only had a ‚vague feeling of uneasiness‘ that led me to further investigation. Hearing the bark invited me find out more, to supplement the auditory with the visual. Following the reverberations of the dog’s sound and further guided by the material structure of the landscape – the layout of the meadow with its path going through a thicket – my perceptions thickened when I saw the hunter and the dog. I felt a ‚tension‘ – not just in me that made me speed up but also in the coming-into-being of the situation. Although I did not know it consciously, my previous experience of pressure hunts prepared me enough that I felt a menacing ‚foreshadowing of an imminent order‘ that I explored more by coming closer and thereby by letting myself be absorbed more and more by the situation. My own position within the situation was still indeterminate, as were the positions of the other beaters who came along. The situation was organizing itself around the two animals, the dog and the sow. Only when D. removed his rifle from his shoulder did this ‚thing‘ gather us all in a determinate way. Everything fell into place now and I suddenly could perceive the situation as an Abfangsituation (cf. Merleau-Ponty 2004:20 and his example of perceiving a stranded ship). My argument from a dwelling perspective is that although I was in a killing situation with a wounded and suffering animal, the situation was not a very reflective, emotional one. It was an affective situation in which everyone involved was highly attentive and responded constantly – all to their own skills – to what was going on. In today’s hunting practices in Germany, Abfangsituations are extraordinary situations. Not only because Abfangen is an ‚emergency practice‘, but because it forces the hunter into proximity and visibility. Usually, the hunter is hidden, disguised, striking suddenly, out of nowhere (even in driven hunts where the beaters make a noise but the hunters are still silent). In order to kill through Abfangen, they have to reveal themselves to the animal, thereby becoming visible and identifiable as the bringer of death, a visibility that is mirrored in the eyes and the look of the animal (who is also revealed in its suffering) and reflects back on the hunter who realizes his or her responsibility and involvement in the action of killing. This is the only situation in which the hunter might get literally ‚in touch‘ with the living animal (not with the dead animal as when field dressing). In the story above, the Abfangen was accomplished with a rifle. Alternatively, hunters might use a pistol or revolver, exclusively carried by some for this purpose. The problem with rifles is that in Abfangsituations one needs to be close to the animal. Yet shooting at close range is more difficult than it seems as the telescope on the rifle is geared towards long-range shots. Through the ballistic curve, the projectile does not hit where you aim at (hence the close-range pistol or revolver). On a recent hunt I overheard two hunters discussing with obvious disgust how a hunting guest had managed to wound a roe deer at ten metres, then moved in to wound it a second time and then a third time. Obviously, so the hunters, this hunter was not familiar with and skilled at shooting at close range. His lack of skill reflected badly on him. His lack of shooting skill resulted in repeated (and in their eyes, unnecessary) suffering for the animal. And what is more, his complete incompetence was made evident in his inability to properly end the suffering by a correct Abfangen. The appropriate technique, according to these two hunters (and many others), is to use so-called ‚cold weapons‘, i.e. daggers or spears. These are a hunter’s specialist weapons for close-range killing (the Saufeder, the Saufänger, the Hirschfänger, the Nicker). Usually, such a weapon is stabbed into the chest from under the foreleg (Blattfang), turned and twisted so as to maximize internal injuries to the heart and/or the lungs which should (ideally) be fatal within seconds. Another technique (for young or female animals only) is a stab in the chest from the front (Kälberfang). And especially for roe deer, a rather difficult technique involves the cutting of the spinal cord with a stab of the tip of a small knife (Abnicken). [Footnote:abschlagen, abfedern] All these techniques demand skill in handling the weapon and in handling a wounded and suffering animal. And even with skill, killing is not necessarily without difficulties. On a hunt this January, a female roe deer was first wounded on the foreleg, then shot in the guts. Although she could not walk anymore, she was not dead yet when W. arrived, stabbing her with his Hirschfänger in her chest. I arrived briefly afterwards, just as he withdrew his dagger and cleaned the blood-dripping red blade in the white snow next to the roe deer who was still twitching, the body heaving from her final breaths. But somehow it seemed to take too long for W.’s taste, so he cut her throat as well. „You’re dead already. Don’t you know that?“ he said softly to the doe, bending her head backwards to open the slashed throat a bit more, then cutting through the spinal cord quickly until she stopped moving and her eyes looked dead. W. cleaned the bloody blade once more and re-sheathed it, all the while shooing the dogs away who wanted to grab and take a bite out of the doe. He then drew the dead body over to the path where we would retrieve it later, leaving a dark red pool of blood and a blood-smeared spoor in the snow. Such a story may be cited by the modernist, ecologically-minded hunters in Germany. For them, Abfangen with a cold weapon is despised for reasons of animal welfare in regard to hunting as a professionalized practice of killing (close-range shooting with a pistol or revolver is said to be most ‚effective‘). Further, the use of a cold weapon violates the animal’s presumed ‚inherent wildness‘ („nothing is more cruel to a wild animal than to be touched by a human being“). Debates on this issue are ongoing. When one is hunting, the air has another, more exquisite feel as it glides over the skin or enters the lungs, the rocks acquire a more expressive physiognomy, and the vegetation becomes loaded with meaning. But all this is due to the fact that the hunter, while he advances or waits crouching, feels tied through the earth to the animal he pursues, whether the animal is in view, hidden, or absent (Ortega y Gasset 2007:131).